Isaac Allerton (c. 1560 – 1659) was born in England. In 1620, he travelled on the Mayflower with his wife, three children and apprentice John Hooke. Allerton belonged to the religion which was not allowed in England. In 1614 he and his family moved to Leiden Netherlands where he worked as a tailor. He married and had three children. In the first year many people died from the cold weather and hunger including Allerton's wife and his apprentice. Allerton worked with Plymouth Governors to help save the colony. Starting in 1626, Allerton made many trips back and forth to England. 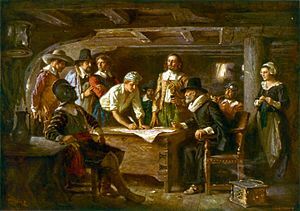 The Mayflower passengers owed money to people in England who had helped pay for their voyage. Allerton was supposed to go to England and pay off some of this debt. Some of the people did not think that he was honest with the money. On one of his trips back from England, in 1630, Allerton came back without some of the supplies which they very much needed. In 1634, another sickness came to Plymouth Colony which caused many people to die including Allerton's second wife Fear. Allerton died in 1659 in New Haven, Connecticut. His first wife, Mary died in 1621 and was buried in Cole's Hill Burial Ground, Plymouth. The burial place of his second wife, Fear is unknown.